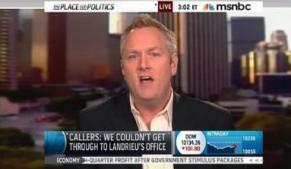 Now that Andrew Breitbart and David Shuster have sufficiently yelled at each other on MSNBC over the James O’Keefe III arrest, let’s recap how we got to this point – and what’s next. Here’s a few of the big storylines. Twitter has played a major role in the entire back-and-forth. @jamesokeefeIII oh, and did I mention that your tweet will help prosecutors prove intent? Keep at it, young man. I’m enjoying this a lot. This jumping to conclusions caused a bit of an uproar in the right-wing blogosphere. • …And it also seemed to cause a minor uproar within MSNBC. Politico’s Michael Calderone has a response from an MSNBC spokesperson about Shuster’s tweets. “The comments were inappropriate,” said a spokesperson. “We have talked to David about them.” Talked, but something more? Shuster hasn’t tweeted since early Wednesday morning – we’ve reached out to MSNBC to see if he has been suspended from using the service for any amount of time. Then there was the big showdown. And then there’s the aftermath. As you see, Shuster is attempting to lure me into this story based upon the false premise of his objective neutrality. Notice he says, “As I said, I don’t have a horse in this race.” A simple Google search of David Shuster and James O’Keefe immediately finds that Shuster went into a Twitter frenzy to tar and feather James O’Keefe and propagated what are now provably false lies about the Landrieu case. Did Breitbart not know what he was getting into? It’s hard to believe, considering the whole backstory.